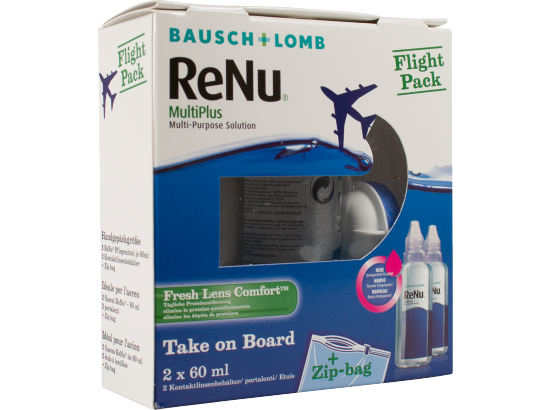 ReNu MultiPlus Flight Pack - 2 x 60 ml.+ 1 storage case. For cleaning and storage of all types of soft contact lenses. Fits easily in a pocket. Ideal when travelling. 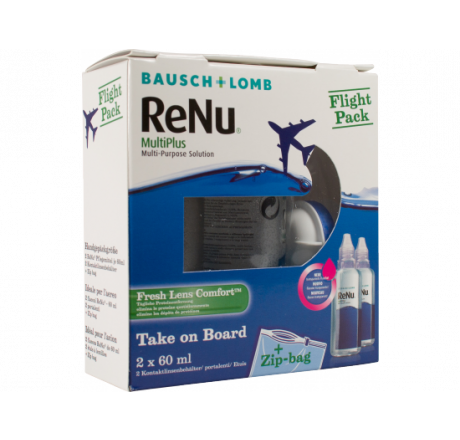 ReNu MultiPlus Fligh Pack - 2 x 60 ml. bottles & 1 lens cleaner case - For cleaning and storage of all types of soft contact lenses. Fits easily in a pocket. Ideal when travelling. ReNu MultiPlus Multi-Purpose Solution is the only multi-purpose solution that contains HYDRANATE, a special ingredient that removes protein deposits while you clean your lenses. ReNu MultiPlus Multi-Purpose Solution makes lens care easy. Contains: 2 x 60 ml. Type For cleaning and storage of all types of soft contact lenses.